What does it do to someone when their core way of being is removed, leaving no other options available? The Beijing-born, US-based director Chloé Zhao's docu-fiction aesthetic lacked dramatic punch in her otherwise impressive debut, 2015's Songs My Brothers Taught Me. 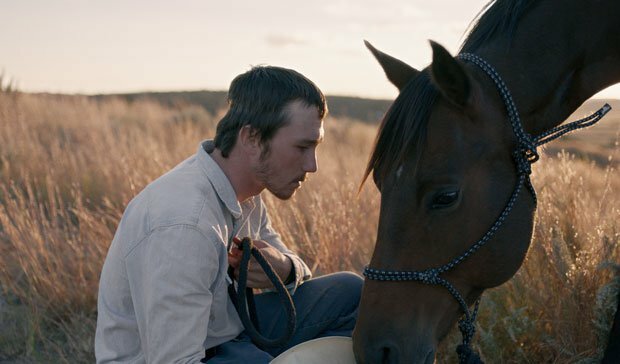 But her Cannes prize-winning follow-up's take on the existential traumas of an injured South Dakotan bronco-rider broods with an unforced inner tension, amplified by Zhao's strain of lyrical naturalism. As with her first film, Zhao uses non-professional actors; this time, her cast re-enact recently lived stories. Brady Jandreau becomes Brady Blackburn, a rider with his head stapled together after a nasty rodeo accident. Advised that another fall could kill him, Brady is in quiet crisis: when all his life he has been taught to 'cowboy up… be a man,' keeping away from horses is like trying to go easy on oxygen. The slow-burn pace and stress on lived-in sensation gives us time to get under Brady's skin. We watch as he meticulously protects his skull with cellophane before showering and, as we meet his tough-talking father Wayne, autistic sister Lilly and close friend Lane Scott – now disabled after his own accident – our empathy with Brady deepens through a tender but non-sentimental understanding of his emotional ties. Working with God's Own Country DP Joshua James Richards, Zhao drinks in the gorgeously craggy South Dakota scenery, drawing out Brady and his friends' affinity with the landscape. Into this languid framework, pointed notes of heart-in-mouth anxiety emerge: as Brady gets back in the saddle, we never forget he is actually doing this. Even if Zhao overstates one or two metaphors, she captures Brady's inner struggle with mesmerising authenticity. Selected release from Fri 14 Sep.
Brady (Jandreau) is a South Dakotan bronco rider whose head has been stapled together following a rodeo accident, and who must face that another fall could kill him. Zhao uses non-professional actors to great effect, and the film broods with unforced inner tension and lyric naturalism.